Bety received her Bachelor’s Degree in Latin American Literature from the University of California at Berkeley. While completing her studies, Beatriz volunteered as an interpreter for the East Bay Sanctuary Covenant, an organization that provides advocacy and legal services to refugees and immigrants. From August 2009 to August 2012, Bety worked as a research study coordinator within the Division of Endocrinology at Children’s Hospital Los Angeles. 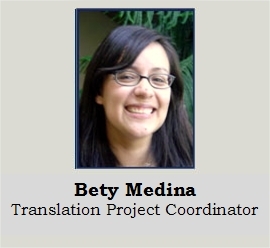 She is a trained interviewer for patient-reported outcomes measures and works on cross-cultural adaptation projects (focusing on US Spanish) as well as other data-collection activities.